West Palm Beach, FL – A month into the wet season after record May rainfall fell across the region, a public-private partnership between the South Florida Water Management District (SFWMD) and the Caulkins Citrus Company has been working at full capacity to store local stormwater runoff and help reduce U.S. Army Corps of Engineers' discharges from Lake Okeechobee to the St. Lucie Estuary. "Every gallon stored counts during this high water situation," said SFWMD Governing Board Member Brandon Tucker. "The state is doing its part to finish major restoration projects that will store water and protect the estuaries long-term. In the meantime, private landowners like the Caulkins family are stepping up with these public-private partnerships to do their part by giving us the flexibility we need to store water in the short-term helping reduce flows to the estuaries." The Caulkins Water Farm is built on a 3,200-acre former citrus grove east of Indiantown just off the C-44 Canal. After a two-year pilot project stored more than 40,500 acre-feet of water from the canal and direct rainfall on just 450 acres, SFWMD and the Caulkins Citrus Company formed a public-private partnership to help store water on a much larger scale. 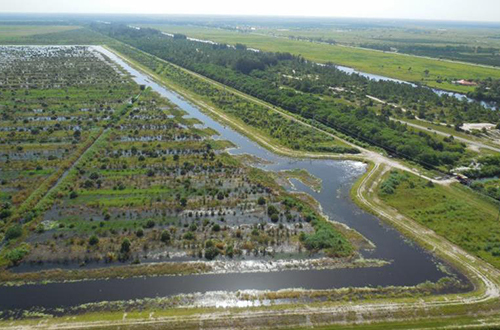 Since May 15, the Caulkins Water Farm has stored more than 5,500 acre-feet of local basin runoff and Lake Okeechobee discharges on top of the 6,000 acre-feet of direct rainfall on the site, keeping that water from flowing into the St. Lucie Estuary.